Absersoch is a perfect destination for beachgoers who love water sports. Boats and yachts explore the seas just beyond the beach, while the area is excellent for windsurfing thanks to the prevailing breeze that blows regularly across the bay. Those who prefer to stay on shore can rent a beach hut or just stretch out and catch the sun. 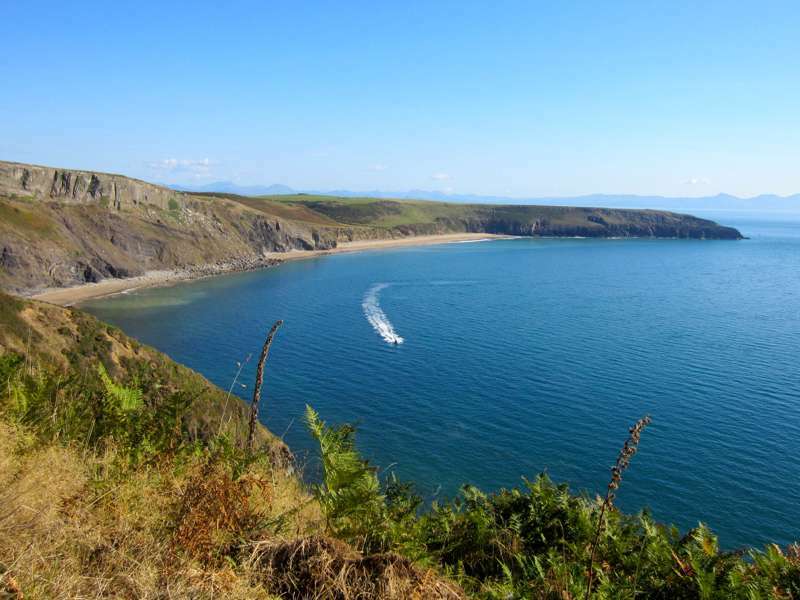 There are a number of other beaches around Abersoch that visitors can find too, ranging in size. At certain times during the year, the smaller beaches are less frequented, which means visitors can find plenty of space. Barmouth is a quaint town, sandwiched between a wide-open beach and the Welsh mountains. The beach is actually located within the boundary of Snowdonia National Park and is the most popular beach in the area. There is a great camping spot right next to the beach. Campers can wake up in the morning with the beach right outside their tents. Barmouth is a traditional seaside town, and visitors can find games, cafés and pubs to busy them throughout the day. Visitors to Llandudno have a great variety when choosing a beach. Llandudno is the largest resort town in Wales, and its North Shore and West Shore beaches are both award winning. Llandudno North Shore is the more popular. It features a long Victorian pier and promenade for beachgoers to stroll, while the West Shore is the quieter of the two. When the tide goes out the large sandy beach is exposed and there's a vast amount of space to enjoy. Criccieth beach is overlooked by an imposing 13th-century castle. Visitors to the beach will be in the shadow of the castle's ruins. Criccieth is a sandy beach with areas of shingle. The shingle is more prominent near the castle and families with small children can avoid it all together. Visitors can stroll the promenade that runs along the beach. After spending a day at the shore, travellers can cross over the promenade into Criccieth for a meal or drink at one of the pubs. Black Rock Sands is a two-mile stretch of sand that features very few rocks. Known locally as Morfa Bychan, Black Rock Sands provides incredible views of Snowdonia National Park. Visitors can find everything they need in the village of Morfa Bychan when holidaying in the area. There are shops, restaurants, pubs and plenty of great places to camp. There is also a golf course when visitors get tired of the beach. The sandy shoreline of Dinas Dinlle provides great fishing opportunities to travellers. Bassing fishing is a popular pastime in the area. The area is popular with boaters and jet ski riders. Water skiers also have the chance to practice their watersport at Dinas Dinlle as powerboats are permitted away from the beach. The prevailing wind that blow in from the sea also make Dinas Dinlle a great place for wind surfing. The beach has a campsite and shop nearby, making it easy for beachgoers to spend all day on the shore before camping when the sun goes down. Fairbourne is a beautiful, expansive beach. It is a favourite for local surfers and kayakers as its wide-open nature gives everyone plenty of space. There is a promenade for holidaymakers to stroll, and shops to purchase goods from. A café and restaurant are nearby, providing families the chance to dine after enjoying the surf and sun, while the excellent Mawddach Trail lets you cycle car-free to the beach from further south (it's an excellent route to cycle regardless of whether you intend to visit the beach or not). Outdoor enthusiasts will love Penmaenmawr. The small resort village has excellent mountain pathways to explore. The walks offer stunning views of the natural landscapes of Penmaenmawr, while the beach is a combination of sand and pebbles. A promenade leads to the beach and visitors can find cafés, amusement arcades and a grassy area along the promenade. A children's play area is also located at the beach for families with small kids. Surfing, kayaking and wind surfing are all popular.